Snap! 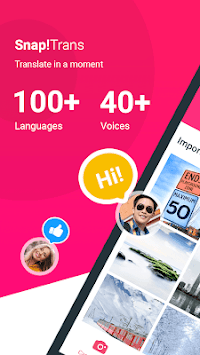 Translate can accurately translate 100+ languages, such as English, Spanish, French, German, Japanese, Chinese, Korean, Thai, Russian etc. It supports to scan any printed files or photos into text and translate into any languages you want, which is a very good scan photo translation tool for study, business and travel. Let's talk through Snap! Translate. We'll take turns talking and listening to translations. Whenever you need translations during your travels, business trips, or while studying, just come and enjoy Snap! Translate. Over 90 languages supported for translation. Support 100+ languages for photo translation and automatic recognition of the source language. 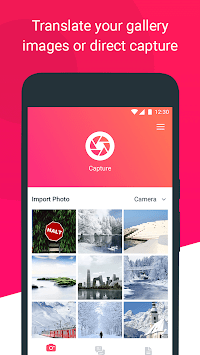 Just use camera to translate photo or printed pictures and get instant translations whatever languages you want. Identify 40+ languages voice accurately. You can translate English to French, English to Chinese, English to Japanese and so on. Whether documents, recipes, menus or instructions, you can use the camera translator to scan photo and get the translation. Scan photos and turns into text, the photo translator is so accurate. Translate words and sentences quickly, just like a translator dictionary. Also translate photo into text is very convenient. More useful than just translate text. You can save the photo translator by sharing to friends via email or other tools. Add words or sentences to collection and check translation at any time.